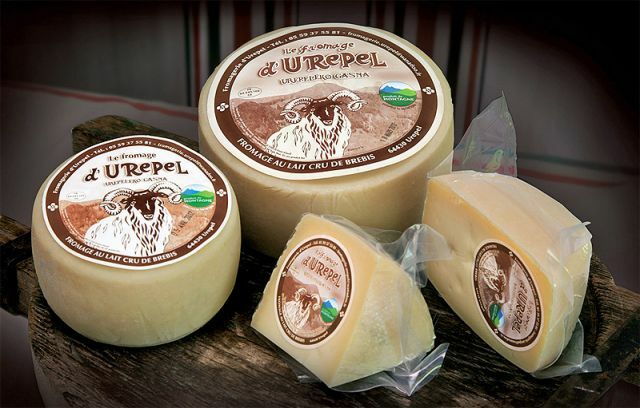 The reputation of the Basque Country gastronomy comes from their local products, often from some small family farms, livestock farming, respecting traditions and know-how. Cheeses, peppers, wines, hams, cake… but also the Atlantic Ocean seafood inspires the variety of the Basque cuisine, a cuisine of character. Since the middle of the 19th century, in the Basque Country, men’s gastronomic societies have played an important role in the handing down the Basque cultural and culinary heritage from generation to generation. The Basque products and local dishes can be tasted in many good restaurants. If you head in the countryside, towards the small villages, you will discover traditional restaurants and Cider houses. The cider houses are a real institution in the Basque Country where people eat around a large table a rib steak and drink Basque cider. Photo: Artisanal Txopinondo Cider House in Ascain. In the Basque Country, seafood products play a major part in the cooking: shellfish, anchovies, sea bream, tuna and the famous chipirons (small squids) in black ink sauce or stuffed with piquillos (on the Spanish side), are part of many dishes. The Basque charcuterie (salted meat) is a real institution with many local specialities (salami, dry sausage, black pudding, pâté, streaky beacon…) very often spiced to tantalise your taste buds. 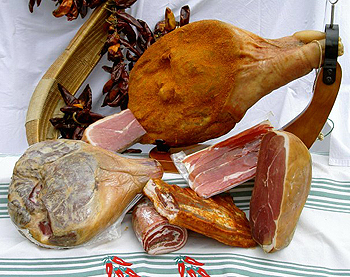 Bayonne Ham is produced with pork from the southwest and cured exclusively in the Adour Bassin. This raw ham is salted with Salies-de-Béarn salt and then dried between 7 to 12 months, it holds a Protected Geographical Indication (PGI), Bayonne ham is a true delight, melting in the mouth, flavoured and very tasty. 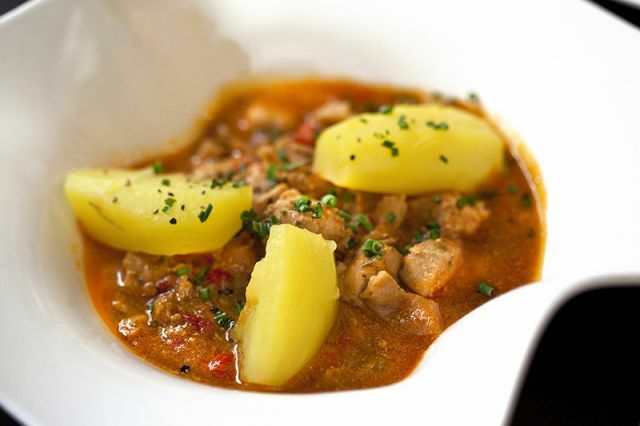 On the culinary side, we recommend the veal “Axoa”, a spicy minced veal dish. Chicken and lamb are also prepared “à la basquaise”, with a piperade made of tomatoes, onions, green peppers and chilli peppers. Garbure is a rustic soup made of a mix of vegetables and meat confit. Salmis of wood pigeon, roasted wood pigeon in a “salmis” sauce is the national dish, wood pigeons are roasted during the hunting season, a Basque ritual during October and November. Trouts and rainbow trouts fished in the streams are often served as starters. 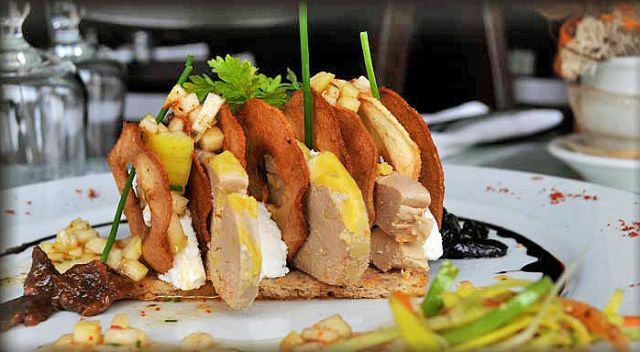 You should try the renowned Banka trout, farmed in the famous and beautiful valley of the Aldudes. For dessert, the Basque cake made of black cherries or pastry cream and ground almond is a true delight made to a traditional recipe since the 17th century. An other speciality, also dating back from the 17th century, using almond, sugar and egg white: the macaroon. Smooth and melting in the mouth, you cannot resist this delicacy. Chocolate was Basque before it was French. It appeared in Bayonne and Biarritz during the 16th century, coming from Mexico to Spain. 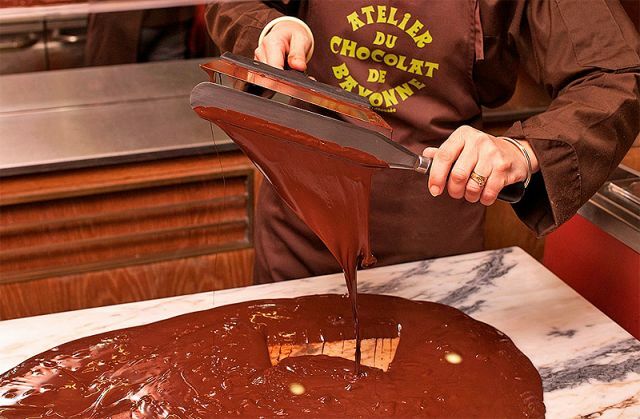 Many big companies have made the Basque Country, the historical capital of the chocolate. The Irouleguy wines (White, red or rosés), which the vineyard is situated close to Mont Arradoy, are very flavoured and robust, they can be served with all types of dishes, salted meat, cheeses, fishes and shellfish. Cider, which is believed to date back from the Roman period, also plays an important role in the Basque gastronomy. It is generally consumed in a cider house. Basque liquors include “Izarra”, composed with Armagnac and Pyrénées plants, could be either yellow or green depending on its alcoholic strength and the “Patxaran” is a liquor composed of wild sloe berries and aniseed. The Basque Country, situated between sea and mountain, is considered as a “land of Cockaigne” (land of plenty), offering a variety of local products and composed of delicious recipes appreciated by all the gourmets. The art of cuisine in the Basque Country is part of its cultural and culinary heritage.